When looking for the right kind of stone tile to stock your warehouse with, you need to be strategic about it. It cannot be about what you like, and it cannot be about what just a handful of buyers like. You really have to look at the entire market and determine what kind of residential and commercial products sell. Now, keep in mind that commercial buildings are a little different because most buyers who are interested in this type of purchase are investors and developers and they may already have a plan of redesigning the interior. With a residential building, you have to think long-term in the way of resale value. So the type of tile you choose to build residential dwellings with can have an impact on your long-term business whether you are a marble title distributor or managing a contracting company. Whatever line of business you’re in, if you need a bulk supply of marble tile for your residential and commercial dwelling, you need to stock a product that’s going to move! What this means for you is that you’ll need to research the housing market to see exactly what kind of dwellings sell. 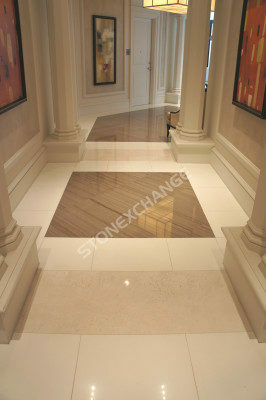 This ought to give you an idea of what kinds of marble tiles sell well. Learn about all of the different kinds of marble tile, engineered stone, and porcelain tiles that are available to you in the market. Nalboor Tiles has a huge warehouse of inventory stocking different kinds of natural stone tile in standard 18” x 18” x 1/2” and 24″ x 24″ x 5/8″ as well as mosaics. What’s now becoming more popular is the engineered stone and porcelain tiles. The engineered stone tends to be more popular because it doesn’t require as much maintenance as natural stone. However, you can expect to pay for the convenience of a maintenance-free tile. Engineered Stone – Nalboor Tiles offers two types of engineered stone: Laminated Marmo Glass and Full Body Marmo Glass. The properties for each of these options are similar except for one major detail that explains it in all in the name. First of all, you need to understand how Nalboor Tile’s engineered stone is made. It is composed of crushed ceramic and white glass crystals. Engineered stone can be considered just as natural marble or travertine because it is made up of recyclable material making it eco-friendly. However, this kind of tile does not come cheap. While it doesn’t require the laboring of mining, there’s still a process in creating engineered stone. Laminated Marmo Glass – Has 2-3 mm of laminate white glass coating that gives the surface an extra shine as well as protection against any discoloration. Full Body Marmo Glass – This stone offers a more natural-looking feel because it doesn’t have the extra layer of laminate coating. These tiles start out at $5.75 per square foot, although the unit price can be reduced depending on how much you by. Furthermore, because this material is maintenance-free, you’re also paying for that convenience. Another thing to take into consideration with this choice is that it’s only available in white. So, if you’re looking for a clean look, which is common for commercial builds, this kind of engineered stone might be a viable option for you to stock. Find out which ones are in high demand. This is a good indication to determining what buyers prefer. By consulting with a Nalboor Tiles representative, you can learn about what kinds of tiles are selling and what aren’t. A hint as to what kinds of tile to stock will be the ones that seem to sell the most. Since Nalboor Tiles is a wholesale distributor in a variety of tiles, hundreds of contractors, developers, architects, and designers from all over the country come to us to stock their inventory. As a result, we have a pretty good indication as to what kinds of tiles are hot and what’s not. With Nalboor Tiles, you’ll also have the opportunity to sample all of our products. You can request a free sample of any of our tiles online. If you like the product, we encourage you to hold on to that sample so that your clients will have the opportunity to see the kind of product that you offer! You’ll also learn about least expensive alternatives that are available to you that will give the same look. Any type of media that’s regarding home and garden design is screaming marble, marble, marble these days. So as result, the demand for it is going to be high. But what also comes with a high demand on anything is the price per square foot. Nalboor Tiles can recommend other types of tile that may offer a similar look at a lesser price per square foot, even at wholesale prices. This doesn’t necessarily mean that the product is bad or no one wants it. It’s just that if your client likes the look of marble, but doesn’t mind having an alternative material like porcelain, onyx, travertine, limestone, basalt, or coral stone, you might be able to save your company some money. However, it’s wise to keep in mind that we sell our tile in bulk at wholesale prices, so whatever kind of tile you stock, it’s extremely important to keep your band of clients in mind, because it’s all about what they want. Contact a Nalboor Tiles representative today to discuss your tile options at 305-501-4548 or contact us online.